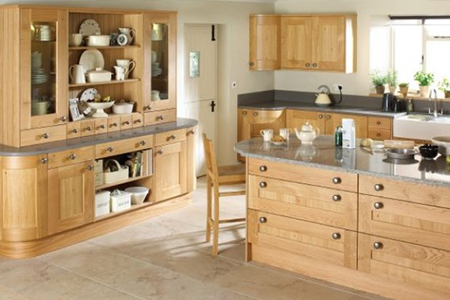 Shaker Kitchens offer a timeless style that looks stunning in any home. 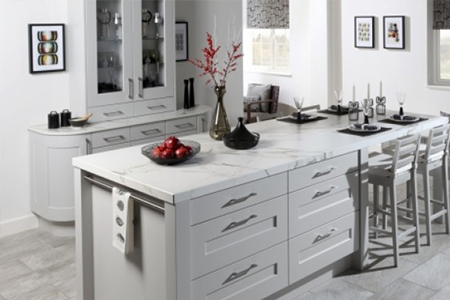 Unfussy and elegant, they offer a high level of versatility with a wealth of options to choose from. The Shakers hand crafted all of their furniture from wood. 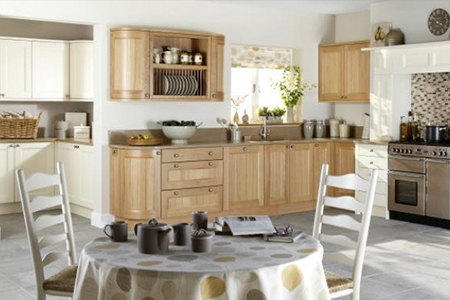 Today's wooden Shaker kitchens are a faithful interpretation their original designs. 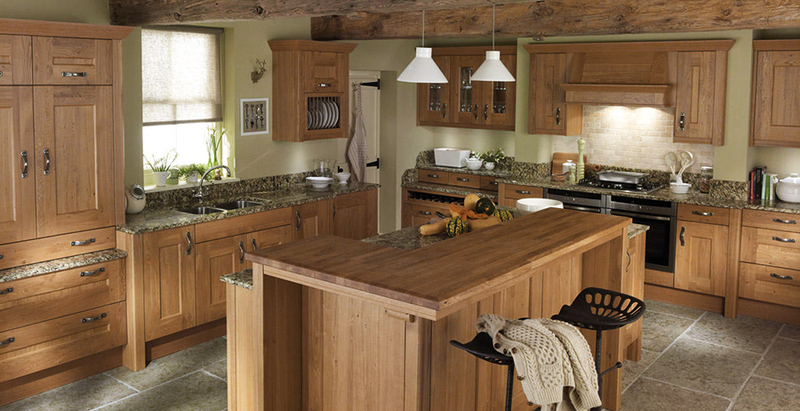 The large scale island and free standing dresser unit are perfect touches in this luxury cottage style kitchen. 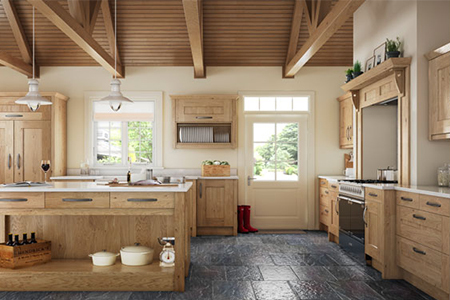 Warm wood tones give this kitchen a high quality yet simple feel, which looks great combined with traditional slate flooring. 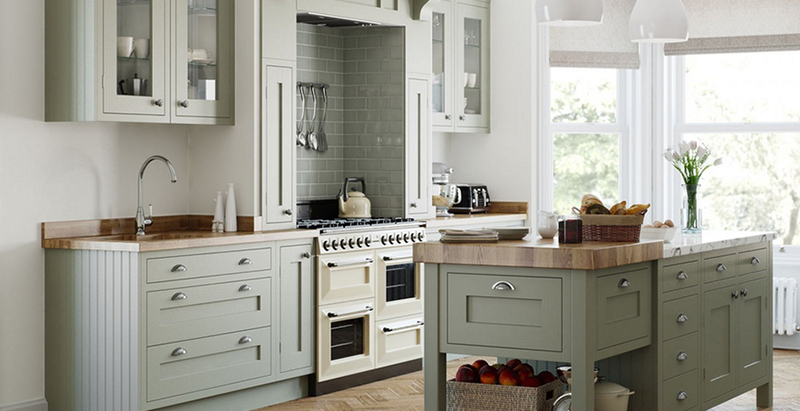 A classically styled wooden kitchen is given an extra splash of personality by combining with painted units and stove surround. This modern wood kitchen looks superb. 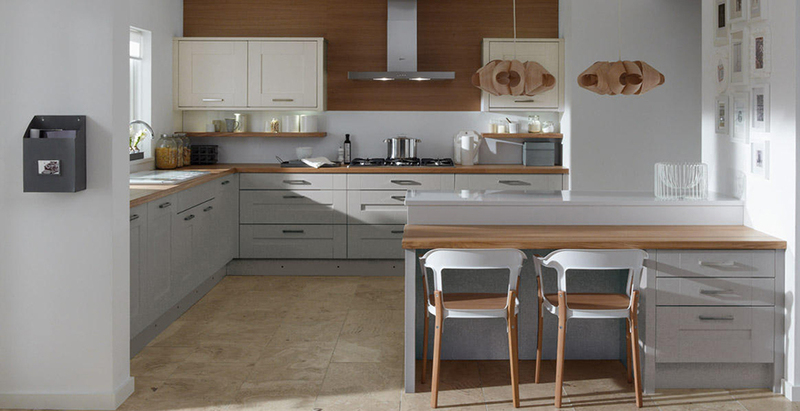 Simple, high quality materials are used in combination for an elegant family space. 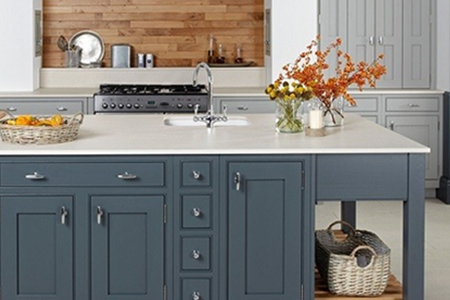 Painted Shaker kitchens bring an extra dimension to the style, providing an opportunity to create something truly unique and personal. 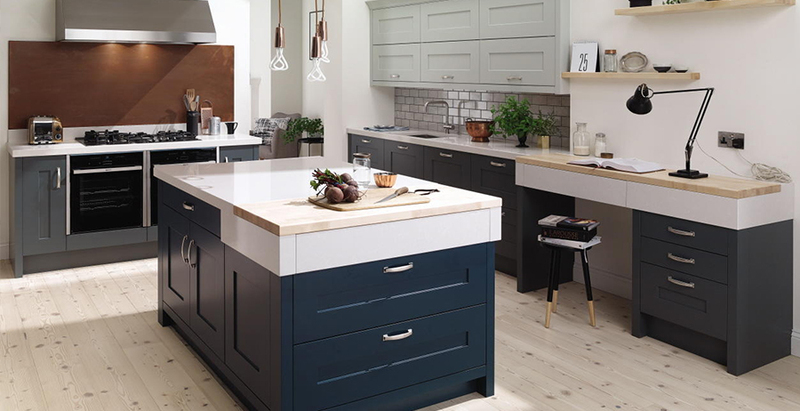 A combination of colours are used to sets this cool kitchen apart, which effortlessly blends both modern and vintage elements. 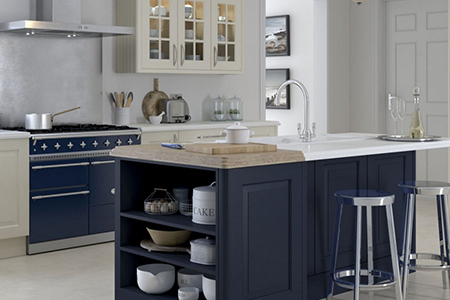 The rich dark blue used on the island contrasts with the lighter cream in this kitchen, to give an otherwise restrained design a brilliant pop of colour. 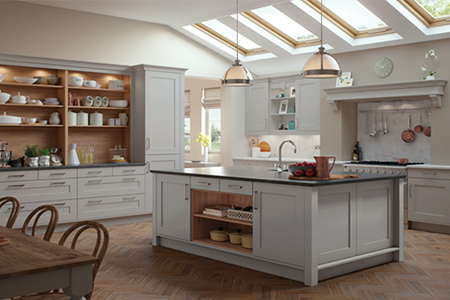 This stunning kitchen blends contemporary soft grey with classic Shaker proportions for an incredibly elegant look. 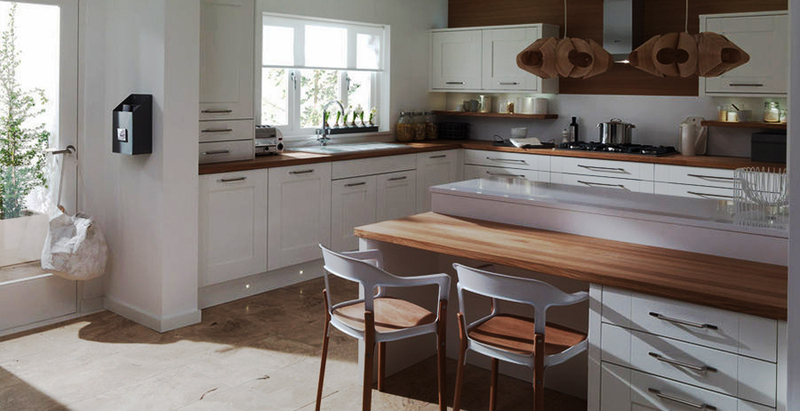 Shaker kitchens look great in contemporary homes. 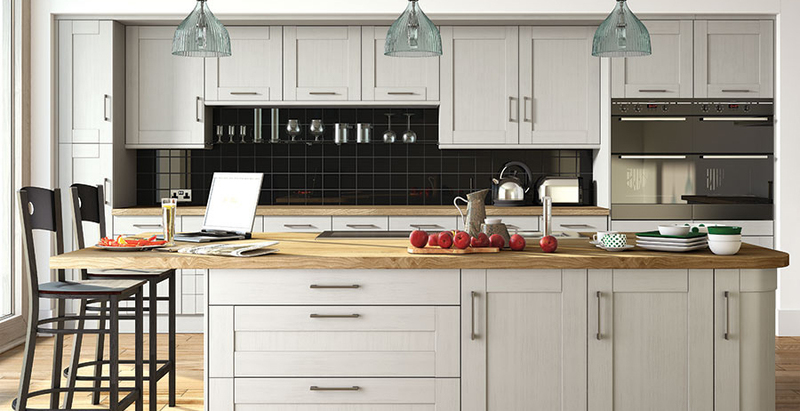 Their simple, clean lines will never go out of fashion and look superb paired with modern fixtures and accessories. 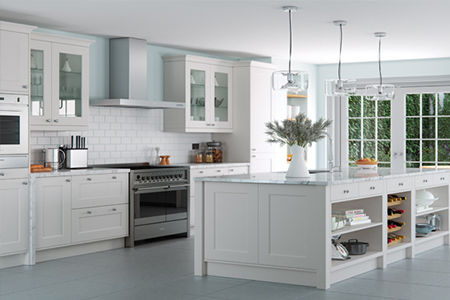 As well as being light and airy, this painted Shaker kitchen includes modern design touches and appliances. 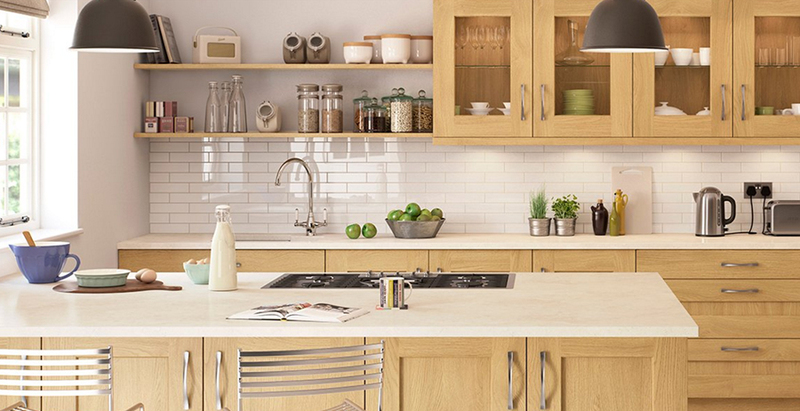 palette is complemented by on-trend marble worktops and transparent over-island lighting. 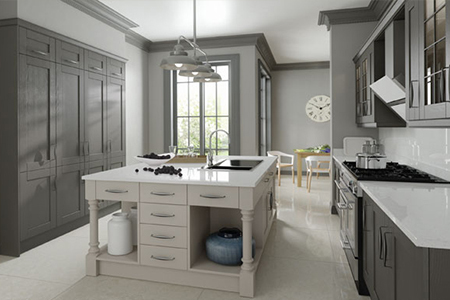 This cool grey kitchen combines beautiful painted shaker cabinets with luxurious marble worktops for a high end look. 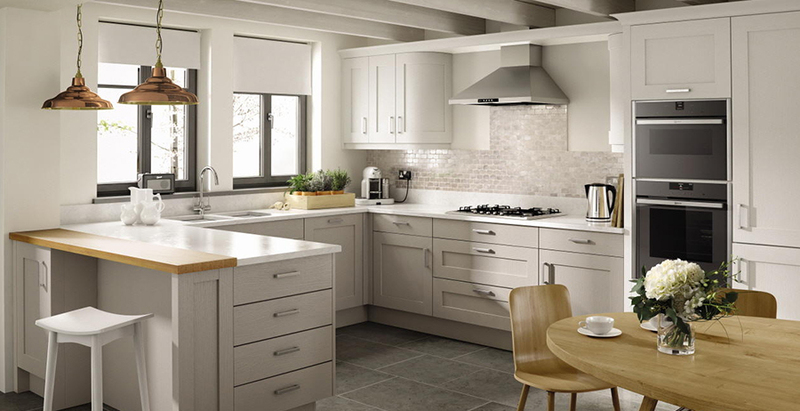 Combining Shaker design with Scandinavian touches, this kitchen provides a relaxing family space with plenty of storage and a large island with room for seating. 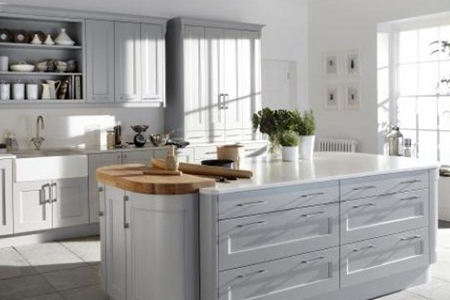 The timeless and honest elegance of Shaker kitchens means they look beautiful in a traditional setting and are perfect for properties of any age. The combination of beautiful wood cabinets, granite worktops and pewter accessories give this kitchen a classic, high end feel. 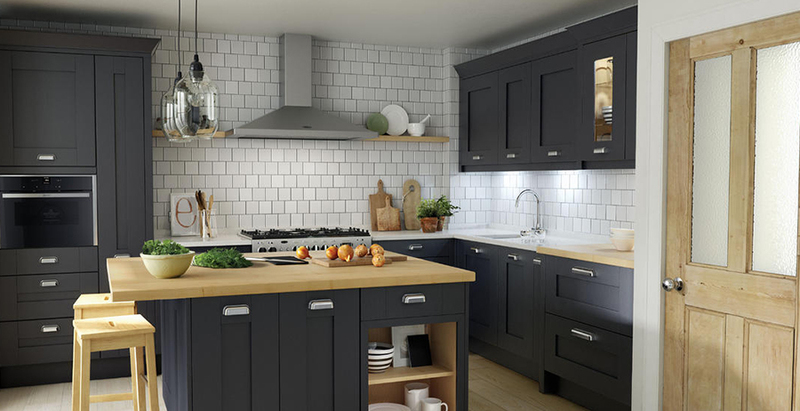 The classic style of this stunning kitchen is given a modern twist with various grey tones used throughout the room for an incredibly elegant look. 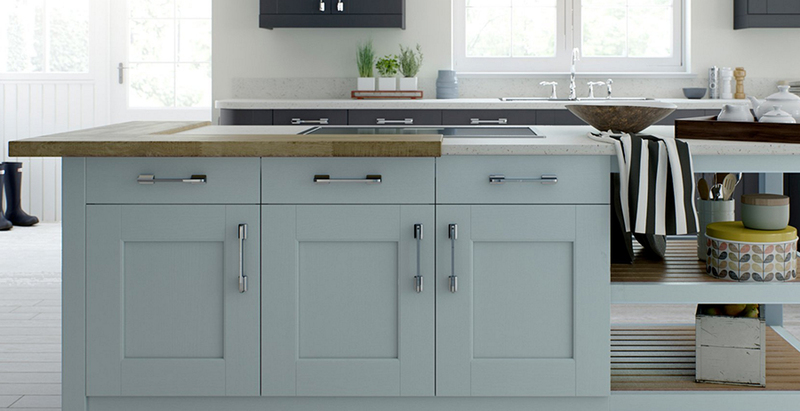 Restrained, sophisticated yet packed full of character, this gorgeous kitchen shows real attention to detail and tasteful use of colour. 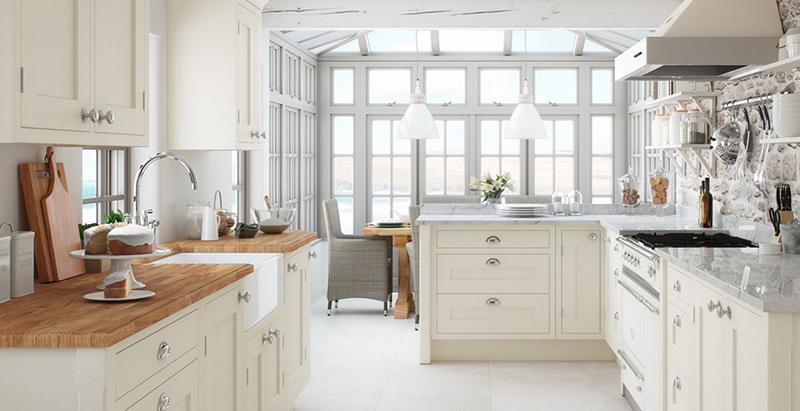 Light and neutral Shaker kitchens enhance the calmness inherent in the style. They help to give a airy, spacious feeling. 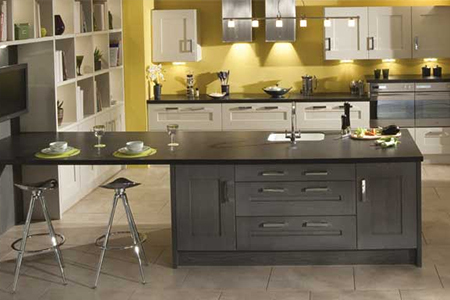 textures of the walls and worktops. 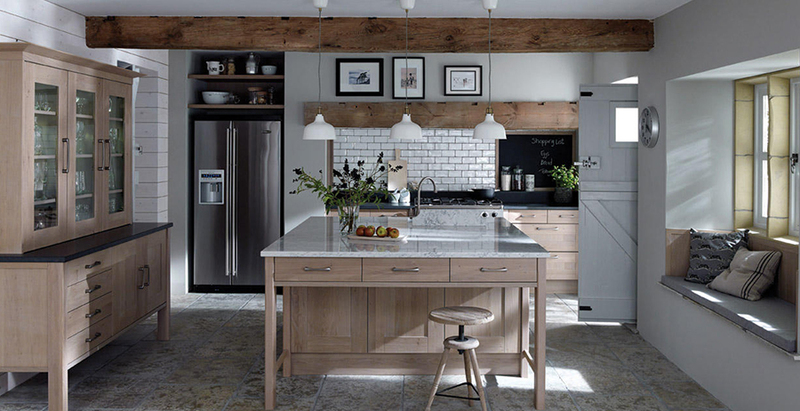 Plenty of light enters this beautiful grey kitchen through the fantastic glazed ceiling, with natural wood and copper accessories adding warmth. 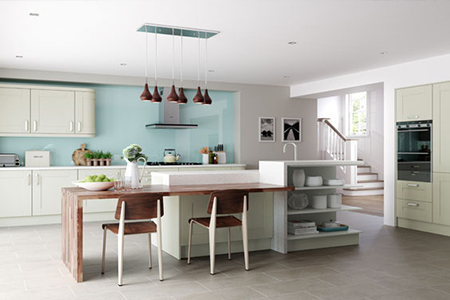 On-trend warm grey is used as the primary colour in this kitchen, highlighted with copper and wood. Plenty of storage reduces clutter, adding to the calm feeling. The large, dark stained oak island in this kitchen adds atmosphere and makes for a great place to grab a bite to eat and catch up on TV. modern look with classic touches.